BRADENTON, Fla. -- If you take a look at the Waterlefe Golf and River Club scorecard before teeing off, the first instinct is to make sure you brought along plenty of range balls. There appears to be water on every hole. Waterlefe Golf and River Club's 14th hole is a 484-yard par 5 that is reachable in two if you land a long drive onto a wide fairway. Don't be alarmed. The only time you will really find water is on the driving range with its five-target greens inside a large lake. Sure, if you are new to the game or swinging with a long noodle, you might find some water, but even though there technically is water on all 18 holes, there's no need to worry. The fairways are generously wide, and there's very little chance of finding anything near the greens that might get wet. Still, Waterlefe has its challenges. 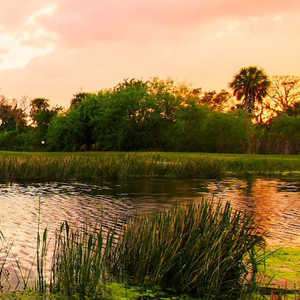 Located in East Bradenton, about a half-hour from Bradenton Beach on the Gulf of Mexico, the golf course makes for an entertaining and fun round without too much challenge. The club attracts mostly locals since there are plenty of clubs much closer to the beaches, and -- being only about 45 minutes from Tampa where there are dozens of professional-quality golf courses -- Waterlefe is for the golfer who needs a boost after some hardship at some of the tougher courses nearby. The golf course was designed by Ted McAnlis and is benign with plenty of scenic holes, including the signature 17th with a long carry over water into a green guarded by bunkers on the left and the right. "We are all about target golf," Waterlefe Head Professional Cory Procter said. "It's a tough and challenging course, and water comes into play on all 18 holes. You'll see a lot of wildlife." The part about the water coming into play on all 18 holes was a little extreme, but the driving range is a treat, and the putting green features undulations that are as difficult as the greens on the course. A free bag of range balls comes along with your green fee, so if you don't mind hitting into the lake, it's a good deal. The course itself is wide open, but bring along some sunscreen. 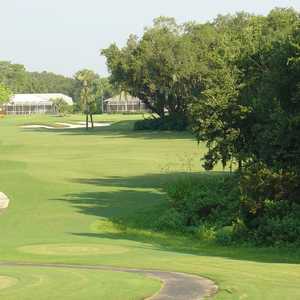 There are very few trees, and that can make it at least a little uncomfortable once summer in Florida comes around with a bite that rivals Phil Mickelson's backspin. Waterlefe is a little bit off the beaten path, but once you get there, it's in a nice setting, just off the Manatee River. There are plenty of homes on the course, but few of them come into play, so you won't be hitting out of anyone's backyard. On the back nine, five holes are right along the lake where there are as many boats as homes, but still, there is enough between the fairway and water that you shouldn't get wet. Five sets of tees make up Waterlefe, ranging from 4,700 to 6,908 yards. If you are used to playing the blue tees, this might be a good chance to test yourself and play from the tips since it is one of the shorter golf courses in the area. All that said, Waterlefe does throw some challenges at you. The greens are large but tricky, and hitting it onto the right tier is important. With the wide fairways and few hazards to navigate, it isn't too demanding for the slightly above-average golfer to reach the green in regulation, but read the greens carefully. At Waterlefe, speed and direction both count since they are very fast. Make sure to spend some time on the practice green since, unlike many courses, they offer a true reading. The first hole starts out as a 547-yard par 5 from the tips. There's plenty of water on both sides, but there's also a generous landing area. Only the best can go for it in two, but the layup areas are large enough that a pitching wedge should get you home in three. The 199-yard, par-3 fourth is surrounded by water that actually does come into play. There's water all along the left and the back of the hole, but there are bushes to stop anything that goes too far. It could get dicey if the pin placement is on the left-front, kind of like No. 16 at Augusta. You can make up any lost strokes at the easy, short, par-4 fifth where Mr. Magoo could find the fairway and green in two. It continues along like that with plenty of water (that really doesn't come into play), wide fairways and little shade. If you can putt, you are looking at a decent score, but if you are looking for decent scenery, Waterlefe provides it. You will find plenty of wildlife all along the course, and the water and the boats make for a pleasant afternoon. Dave Morgan, 28, from Naples, said he had a fun day and had a decent score to go with it. "It wasn't as tough as it looked," Morgan said. "But it wasn't like a lot of Florida golf where you need to hit everything perfect just to stay dry. The service was great, and I like to hit driver as much as I can, so it worked out great." His playing partner, Don Laren, also from Naples, said mid-irons are the keys to scoring at Waterlefe. "My irons were awful today, and I went high," Laren said. "I've played here before, and I know the key to this place is sticking your irons, and I couldn't do it. The course is in great shape, but don't worry about the driver, because it's easy to stay in the fairway; just worry about hitting the greens." Waterlefe Golf and River Club has several PGA Professionals on staff who can provide lessons, club fitting and club repair. Waterlefe is a comfortable course that won't require too many sleeves of golf balls. It makes for a pleasant day after challenging some of the harder courses in the Tampa Bay area. Turn up the accelerator on the driver and get your mid-irons on the green, then go hit the beach.